Sandwich Village is all decked out for Christmas. Last weekend residents, visitors, and quests at our Sandwich bed and breakfast hailed the lighting of the town Christmas tree. All year long this huge, natural spruce next to the Sandwich Town Hall shades the Civil War memorial across the street from the Inn’s driveway. Now, adorned with festive multi-colored Christmas lights, it casts a warm glow over all of Town Hall Square Historic District. The "Holly Days in Sandwich" annual celebration starts with caroling in front of the First Church of Christ and the tree lighting, and continues through Christmas. Visitors can enjoy creative and beautiful decorations throughout the Village and along historic Route 6A, the Old Kings Highway of Colonial days. Sandwich merchants have extended hours on Thursday night and are open all day Saturday, and some have limited hours on Sunday for the shoppers convenience. 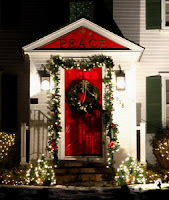 While shopping, note the festively outfitted store windows and the doors of many neighboring homes. Most likely they are participating in the Chamber of Commerce’s “Stores and Doors” decorating contest. New this year, shopper can vote for their favorites on Facebook. No, you cannot vote for the 1750 Inn at Sandwich Center this year, but yes we have been an official ‘winner’ a few times and I think our door this year is still a winner. Sunday is the Holly Days Home Tour with over a dozen antique homes opening their decorated doors to the public. A great chance to see how Christmas may have looked hundreds of years ago. Our Cape Cod B&B is not on the tour this year, but as always, we fully adorned inside and out. Even if you miss the Home Tour, you can get the flavor of a very historic Holiday by staying with us. We have an “In the Spirit’” special and other packages still available between now New Years. 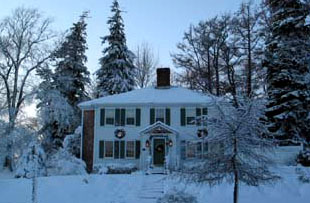 As we look forward to saying goodbye to 2011 and to welcoming in the New Year here at our Sandwich bed and breakfast, our thoughts turn to just how we will celebrate this year. Each December 31st at the stroke of midnight, most of us participate in a tradition that I suppose could now be referred to by the currently popular term ‘flash mob’. I am referring to the moment just before the stroke of midnight when we all stop whatever we are doing, whether it is dancing, dining, or some other traditional (or not so traditional) form of New Year’s Eve celebration, to kiss loved ones and complete strangers, toss down a sparkling beverage, and sing Auld Lang Syne. 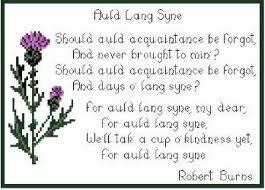 Truth be told, most of us aren’t even sure what the term ‘Auld Lang Syne’ means. The song itself was taken from a poem written in 1788 by the immortal Scottish poet, Robert Frost. The words translate from the old Scottish dialect meaning ‘Old Long Ago’ which is about friendships and loves in times past. The ‘cup o’ kindness’ refers to a drink which men and women share to symbolize friendship. Whether you choose to gather with family or friends at an event large or small, or if you plan on a quiet evening alone with the love of your life, take a moment at the stroke of midnight to clink a glass of bubbly in a toast to dear old friends from you past and present. 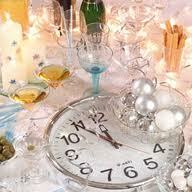 It may not be Time Square but Sandwich is a wonderful place to celebrate the arrival of the New Year. We have a Celebration Special that includes a stay of one night in a fireplace guest room at our Sandwich bed and breakfast, a Sparkling Wine Hour at the Inn, A New Year’s Eve Dinner and Celebration at the unique Belfry Bistro, and a lovely breakfast on New Year’s Day. The total package is only $389 and you can add an additional night for just $149 plus tax. You can enjoy your evening at the Belfry Bistro with all the bubbly you would like without the worry of driving after, as we are just a couple of blocks away. This special can be booked online or just give us a call at 508-888-6958. We would love to help you with your celebration plans.